To get started with the Open Stack demo, log in with the user/pass from the email you received. You will be dropped into the system at the Overview page. This shows you what resources your account is using, and the instances that you currently have running. If this is your first visit, you won’t have any instances up and running yet. To do that, click the Images link on the left side. That will take you to the page that shows which images are available for your account to launch. 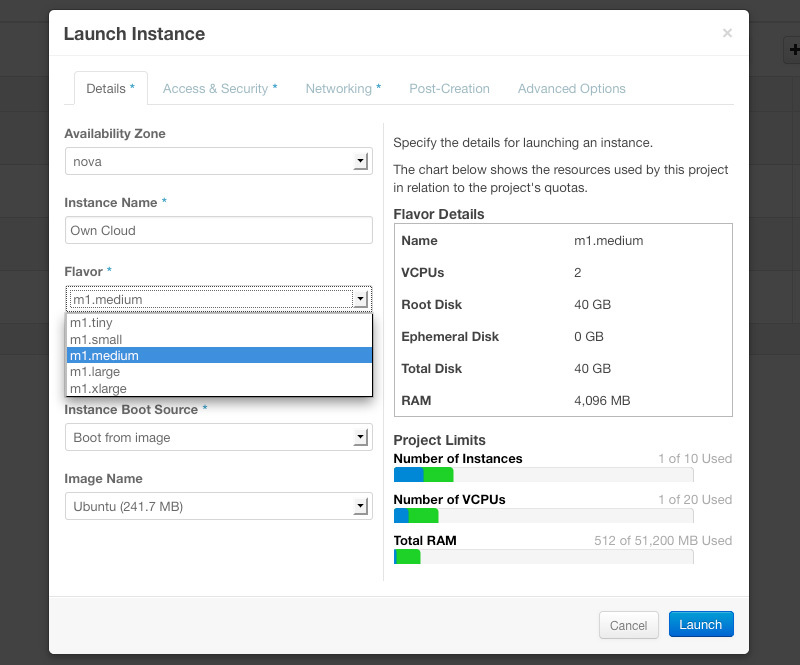 To launch an instance, choose the image you would like to launch and click the Launch button to the right. That will bring up the dialog for launching an instance. In the simplest form, all that is required is that you give the instance a name and choose a flavor. The flavors are the preset resources for a given image. How many CPUS, how much RAM and disk, etc. Once you have that, click Launch and you will be taken to the Instances page where you will see the machine spawn. There are various options available under the More drop down for each instance that will let you control the instance (pause, resume, reboot, etc. ), add floating IPs, or make changes to the various settings for the machine. These demo machines are not available to access from outside, but it is worth taking a look at the Access & Security tab to get an idea of how that works. If you click the Key Pairs tab you will see that you have the options of creating or importing key pairs. When you create a key pair, you will download the .pem file to your local machine. When you launch an instance, you can choose that key pair on the Access & Security tab of the launch dialog. That key will then be injected into the instance, allowing you to SSH into the system with your .pem file. Of course, SSH does get back to networking. 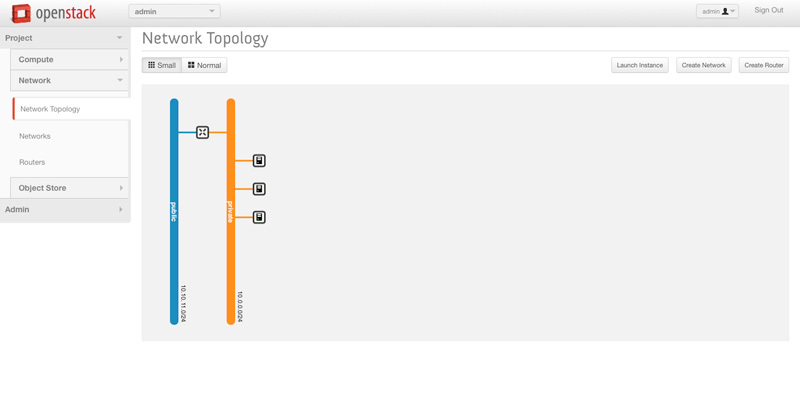 If you click the Network tab and go to the Network Topology, you will see that there is a public and a private network created but they are not connected. These demo machines have not had their networks configured to allow for outside access. The capture below shows a simple networking setup where a router has been added to the configuration to connect the private and public networks. 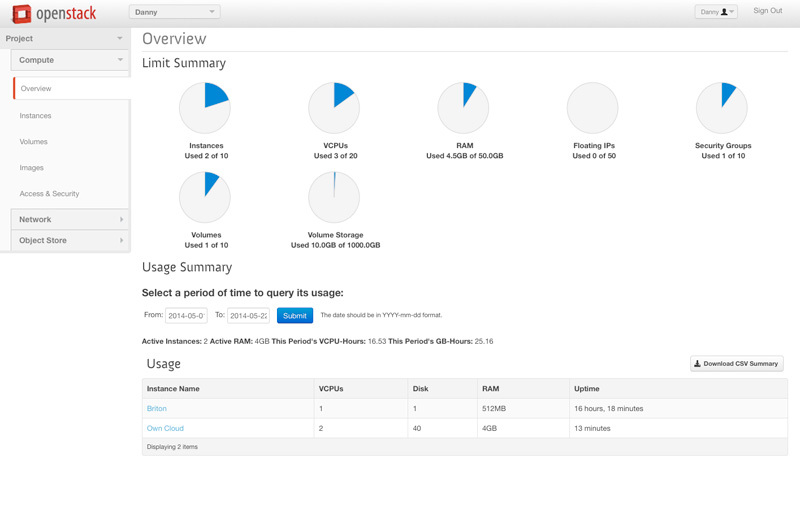 This gives you the ability to associate an external IP with an instance, making it available on your network. In this example, we have a pool of IPs available to pull from on the 10.10.11.0 network. Selecting Associate Floating IP from the More drop down on the Instances page will let you provision one of those IPs for that instance. Once that’s done, it is live on the network. Our last two stops on the tour have to do with data. The Volumes tab gives you a picture of the volumes that are available. Volumes are block storage devices that you attach to instances to enable persistant storage. They can be attached to, or detached from, a running instance at any time. It is just a matter of Clicking the More drop down next to the volume and choosing Edit Attachments. Here you can see that the Documents volume is attached to the Own Cloud instance. Next, is the Container page under Object Store. A container is simply a storage compartment for your data. You can think of it as a folder in Windows, or a directory in UNIX. Once you have a container associated with your account, you can upload data to it through the web interface. Of course, this demo and walk-through is just touching the surface of Open Stack. There are many other options to be explored and implemented through the web-based administration tools and the CLI. That said, this should give you a good idea of the power and flexibility of the system once you have configured it to suit your organization’s needs. Another system is just a few clicks and a few moments away from being available and working.